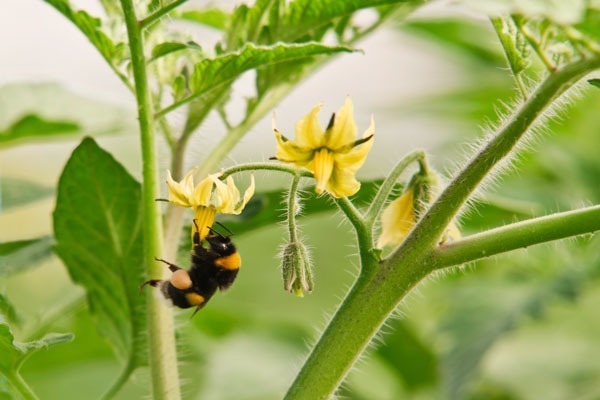 The VegiBee lets you hand pollinate every flower on your tomato plant for a massive increase in yield. Fully pollinate an entire plant in just minutes. Tomatoes, peppers, eggplant, beans, peas, etc. Select a Battery Operated or Rechargeable model. Home Garden Yields are Down! You’re working hard, but getting only a fraction of the yield you deserve. With a dramatic decline in bees, flowers aren’t being naturally pollinated like they used to. Without bees, home gardeners rely on wind to distribute pollen, but it’s highly inefficient. Whether it’s poor soil, low exposure to sunlight, or active pests, the location of your plant can harm yield. You don’t have to roll the dice and hope that bees or the wind will do their job and pollinate your garden. You can take control and deliver a much greater yield than you ever imagined. The VegiBee gives you the power to pollinate every flower on a plant and ensure that your gardening efforts deliver impressive results. You don’t have to rely on mother nature. You can take control over your yield with a tool that’s fun to use and gives you tremendous power. 1 operating instructions booklet with warranty information. Prior to initial use, charge the unit for 12 hours with an AC adapter and 16 hours with the USB connector and a computer. With the collection spoon in place, place the vibrating wand head on the stem. 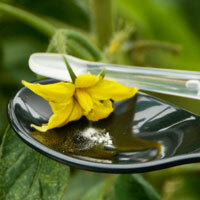 Aim the stigma toward your collection spoon and capture the emission of pollen. 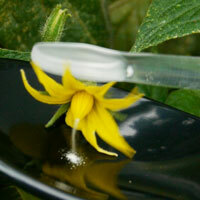 Dip the stigma of the flowers (4-5 from the same plant) into the pollen until it’s all been used. You’re going to be a happier, more successful gardener with the VegiBee. We used the VegiBee on plants at our Iowa office, there were definitely a bunch more tomatoes on there! He doesn’t have exact numbers but, he has had a lot of success! I’m sure the yield increased as the fruit set has definitely increased. The customers who come through the greenhouse are always pretty amazed by it when I make pollen flow out of the tomato flowers using a VegiBee pollinator. Thank you for the shipment! I am working on a tomato project and one of the duties requires me to cross different varieties of tomatoes. 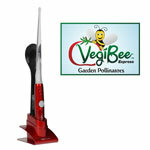 I love how easily and quickly I can collect pollen using your plant-pollinator. It was really exciting to see how it works. It is indeed extremely useful for what I am doing. Thanks for the note and the VegiBee. I’m a bumblebee researcher here at UNR, and I have been happily using the VegiBee to harvest pollen from a number of plant species that I’m interested in studying. One of my current interests is in studying “buzz pollination” behavior in bumblebees. The VegiBee is great for harvesting pollen from local wildflowers that have poricidal anthers at our Tahoe field sites (like shooting star, Manzanita, etc. ), then bringing that pollen back to the lab to offer to bees in preference tests. We used to use tuning forks, but those were a pain in the field…and then Sonicare toothbrushes, but those weren’t quite right. Imagine my surprise at finding a product that does exactly the thing that I need for my research! Quite exciting! We are very happy with your product. It produces lots of pollen although it is a little more time consuming to touch every truss instead of just the plant. However, we are getting less flower drop. You should consider selling to hydro gardens, crop king, greenhouse megastore. 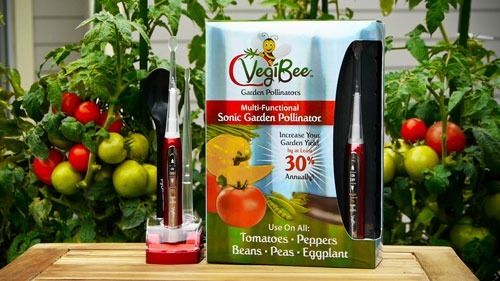 I am a professional plant breeder in Michigan and at first, was not convinced that VegiBee pollinators would help me cross-pollinate plants. I received the VegiBee and tried it for the first time this morning. HOLY COW! Pollen has typically been a limiting factor for me to cross plants. No more! Thanks for your great new product. Thanks again for the Vegibee. I love it and will definitely be promoting it. 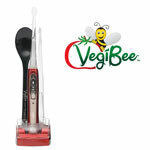 One thing I like about the VegiBee pollinator is it seems to be able to collect pollen later in the day. It has been rare that I have been able to do that outside of being in a greenhouse. This opens up more possibilities for me to collect pollen from different sites and make crosses I didn’t plan. You don’t want to go through another growing season just hoping for the best. It’s time to end the frustration with lackluster results. Put the power in your hands and take control of your yield year after year! The Perfect Gift for the Home Gardener! The VegiBee is designed to improve the crop yield for commercial growers and home gardeners. 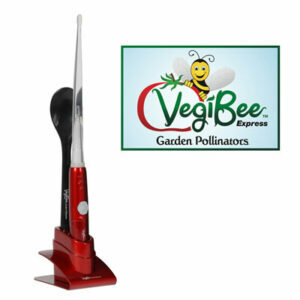 It's ideal for self-pollinating plants such as tomatoes, peppers, beans, peas, and eggplant.